United States national drug control policy is historically reactive, addressing the latest crisis long after it is established. Prevention is the best policy tool available for addressing emerging drug problems, but it is most effective before problems become well-entrenched. Three emerging trends could prove damaging if ignored: (1) cocaine use by young adults is increasing and cocaine-involved overdoses have exploded, (2) heroin and synthetic opioids are driving opioid overdose deaths, and (3) the country is increasingly accepting of marijuana. In light of these trends, we offer five recommendations to develop prevention infrastructure and facilitate proactive solutions. 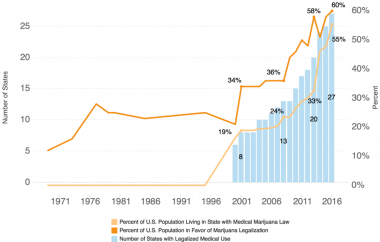 This Policy Brief examines the continued expansion of legalized access to marijuana and changes in public opinion in favor of marijuana liberalization. The brief posits that, in light of this extraordinary movement, government at all levels must turn its attention to being proactive rather than reactive by adopting a systems approach to regulating this new industry and designing programs and policies that protect the public health and safety. This brief presents a number of questions that researchers should seek to answer as part of a national research agenda to close the “knowledge gap” between the pace that legalization is occurring and the extent of available knowledge on its potential effects on drug use, public health, and public safety. 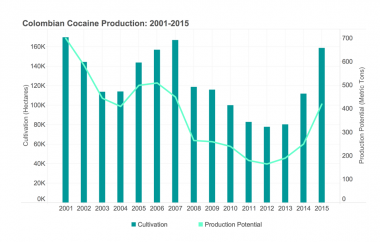 This Policy Brief presents data from the Office of National Drug Control Policy (ONDCP) and the United Nations Office on Drugs and Crime (UNODC) demonstrating increased coca cultivation in Colombia. The brief questions whether the United States is the target for this new coca, but notes that our diminished ability to detect emerging drug trends renders this an unanswerable question. Ultimately, the brief seeks to raise public awareness of the Colombian cultivation and offers suggestions for improving the detection of emerging drug trends, particularly with respect to cocaine. The brief presents "obvious" next steps -- (1) Funding the Arrestee Drug Abuse Monitoring (ADAM) Program, (2) Restoring ONDCP's Research Funding, and (3) Dedicating Funds for Quest Diagnostic Workplace Drug Testing Data-- as well as more controversial next steps. This Information Brief examines the opportunities and challenges for behavioral health providers under the Affordable Care Act (the ACA). With a particular focus on substance abuse, this brief considers three challenges: (1) The ACA Coverage Gap, (2) Providers' Lack of ACA Knowledge and Strategic Plans, and (3) The Need for Client Outreach & Enrollment. The brief offers solutions to providers' practical problems and calls attention to policy issues that require additional consideration or research. This Information Brief examines the Affordable Care Act (the ACA)-- also known as health care reform or "ObamaCare"-- and its potential impact on substance abuse treatment. In particular, this brief considers the impact of the ACA's Medicaid expansion, Affordable Insurance Exchanges, and Essential Health Benefits (EHBs) on the healthcare market, anticipating the law's effects on the financing and provision of substance abuse treatment. The brief predicts that the influx of 27 newly insured individuals coupled with EHB and parity requirements will yield a considerable number of new substance abuse clients and trigger a notable shift in payers. These events, in turn, will drive further changes for both substance abuse treatment providers and clients, as the field moves toward new financial systems that emphasize integrated payment models. This Policy Brief examines prescription drug takeback programs in the context of substance abuse prevention. Across America, drug takeback programs have become increasingly popular as policymakers struggle to provide individuals with a secure and convenient way to dispose of unused medications. To learn more about takeback programs, Carnevale Associates, LLC surveyed a number of programs to better understand their design, costs, and efficacy to support national efforts to reduce the size and scope of the prescription drug epidemic. Our analysis found that these programs vary substantially in cost and approach. In addition, we found no evidence that takeback programs affect prescription drug abuse. We conclude that additional research is needed before incorporating takebacks into any substance abuse prevention plan. With the failure of the Joint Select Committee on Deficit Reduction to reach an agreement, this Policy Brief examines the effects of a $1.2 trillion sequestration (automatic cut) on the federal drug control budget. Slated for implementation beginning in 2013, Carnevale Associates' analysis finds that the proposed cuts would be much more detrimental to demand reduction programs than to supply reduction programs. The disproportionate impact on demand reduction programs may impede the Obama administration’s stated aim of implementing the public health approach promoted in its National Drug Control Strategy. This Policy Brief examines the present state of prescription drug abuse and the potential role of Prescription Drug Monitoring Programs (PDMPs or PMPs) in providing real-time information to inform prevention, treatment, and law enforcement policies, programs, and practices. This Policy Brief examines recent data implying that the methamphetamine epidemic is rebounding after several years of decline. Exploring the relationship between current trends and existing laws, this brief offers policy solutions for prevention, treatment, and law enforcement. The Continued Standstill in Reducing Illicit Drug Use: Is the Policy-Budget Mismatch to Blame? This Policy Brief shows what can happen when a drug policy fails to align program resources with its strategic goals and objectives. The Brief shows that the nation has experienced a standstill in progress to reduce drug use so far in this decade and attributes this lack of progress to the eight-year failure of the Office of National Drug Control Policy (ONDCP) to meaningfully match its federal drug control budget with the demand reduction goals set forth by its own policy. Could Youth Drug Use Be Making a Comeback? This Policy Brief raises the strong possibility of a resurgence in youth drug use. While youth drug use declined by 29 percent from 1997 to 2006, a recent softening of indicators related to youth attitudes about the dangers of drug use and disapproval rates suggests that drug use is making a comeback. The previous administration cut funding for drug prevention programs which might have contributed to this softening of youth attitudes about the dangers of drug use. Further cuts to drug prevention programs are proposed in the federal 2010 budget. This 2009 Information Brief examines Salvia Divinorum ("Salvia") as an emerging drug trend. The strongest naturally occurring hallucinogen, this brief examines Salvia's effects and use patterns, noting that past year Salvia use outpaced both LSD and PCP in 2006. This 2008 Policy Brief highlights the principles of an effective national drug control policy, emphasizing the importance of research-based approaches and the need to link strategy and budget. This 2008 Policy Brief reviews the federal drug control budgets from FY2002 to FY2009, concluding that the budget did not fund programs that research suggests would be most effective in reducing drug demand and its associated damaging consequences. Examining spending data for the decade, the Brief concludes that the federal drug budget trend ran counter to what research would otherwise suggest is necessary for an effective federal drug control policy, emphasizing interdiction and source country programs over treatment, prevention, and domestic law enforcement. Examining research by Simeone and Holland (2006), this 2007 Information Brief examines Prescription Drug Monitoring Programs (PDMPs), demonstrating that PDMPs are effective at both limiting drug supply and reducing the probability of prescription drug abuse. The findings also suggest that proactive monitoring programs-- those that generate unsolicited reports to identify and investigate cases-- are more effective at reducing drug supply and potential abuse than their reactive counterparts, which generate reports only in response to third party requests. This 2007 Policy Brief examined the Office of National Drug Control Policy's (ONDCP) proposed drug budget for FY2008, noting the sharp decline in funding for prevention programming. The brief contends that the FY2008 budget trend goes against well-established principles of effective drug control policy, including the need for a comprehensive balanced approach between interdiction, law enforcement, overseas programs, and prevention and treatment programming. 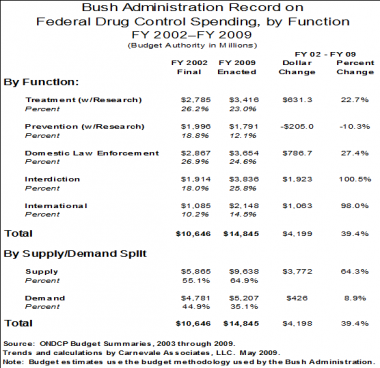 Specifically, the Policy Brief notes that the FY 2008 budget request continues the Bush Administration’s long-term trend of shifting resources away from demand reduction (treatment and prevention programs that seek to discourage individuals from trying illicit substances or help existing drug users stop using) toward supply reduction (programs that attempt to stop the flow of drugs entering the country or disrupt domestic drug markets). This 2005 Information Brief examines the Program Assessment Rating Tool (PART) and its effect on the FY2006 federal drug budget. Comparing federal drug programs' PART scores for FY2005 with the FY2006 proposed funding allocations, the Brief found that program's PART measurements did not appear to be in sync with their FY2006 funding. This 2006 Policy Brief examines the decline of federal support for school-based drug abuse prevention programming. Citing the success of evidence-based school prevention programming, the Brief suggests that federal officials consider augmenting support for such programming in the future. This 2006 Policy Brief examines the supply and demand reduction components of the FY2007 federal drug budget. Charting federal drug control policy spending since FY2001, the Brief notes that federal officials shifted funding to supply reduction activities at the expense of support for demand reduction programming. The Brief questions this shift, in particular because the supply reduction funding was primarily slated for border interdiction and international programming, while the main drugs of abuse were identified to primarily come from domestic sources. This 2006 Information Brief examines the CitiStat philosophy of governance, which transforms government operations by holding those in charge of service delivery accountable for their departments' performance. Citing examples including Syracuse, New York and Baltimore, Maryland, the Brief notes that use of CitiStat is correlated with increased government efficiency and decreased government spending. This 2005 Information Brief examines methods for devising and implementing a local drug control strategy. Outlining models employed by Rochester, New York and the District of Columbia, the Brief offers best practices for crafting performance-based strategies. This 2005 Information Brief examines the role of the National Alliance for Model State Drug Laws in assisting states develop drug control policies. Noting that the Alliance employs a performance-based model to assess the results of law implementation, the Brief outlines the process the Alliance uses to facilitate development of drug control laws. This 2005 Policy Brief examines the impact of the FY2006 federal drug budget on state and local drug control programming. Noting that the budget reduced support for state and local efforts, as well as cooperative programs between the federal government and states and localities, the Brief notes that the FY2006 drug budget marks a shift in U.S. drug policy toward more centralized federal programming. This 2005 Policy Brief reviews the FY2006 federal drug budget. The Brief notes that the FY2006 federal drug budget marks a shift in federal funding toward increased support for border control and international programs and decreased support for state and local governments for support and coordination of prevention and law enforcement. This 2005 Information Brief analyzes the five steps that comprise SAMHSA's Strategic Prevention Framework (SPF): Assessment, Capacity, Planning, Implementation, and Evaluation. In addition, the brief includes a matrix of milestones and products for each of the five SPF steps. This 2004 Information Brief examines means to address substance abuse by college students. Explaining a Colorado State University program based on the drug court model, the Brief finds that the program offers a creative model for colleges to reduce student substance abuse. This 2004 Policy Brief draws attention to the 6.3 million Americans using prescription drugs non-medically. The brief notes that-- even in 2004--prescription drug abuse exceeded historical estimates of the numbers of cocaine and heroin users at the peak of each of their epidemics and yet attracted little media attention or public concern. This 2004 Policy Brief examines child endangerment resulting from methamphetamine exposure. Highlighting the prevalence of such exposure and its negative effects on childhood and prenatal development, the Brief offers policy options to protect drug endangered children. This 2004 Information Brief examines state legislation addressing methamphetamine production and cleanup. In addition, the Brief outlines state efforts to punish child endangerment stemming from methamphetamine, and state laws restricting the sale and possession of precursor chemicals. 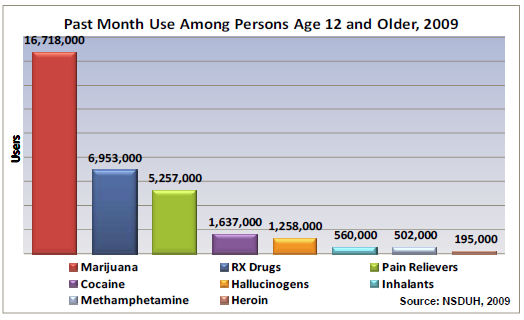 This 2004 Information Brief examines the National Survey on Drug Use and Health (NSDUH) for the 2002 to 2003 period. 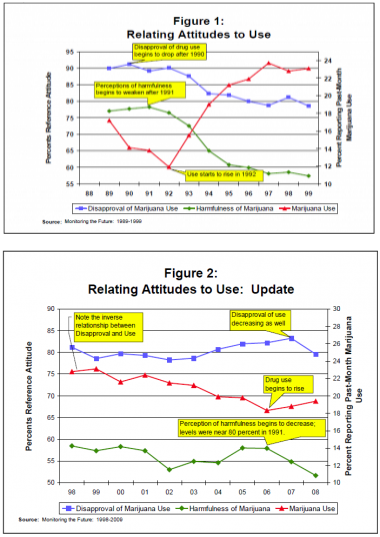 Explaining how the survey works and what it measures, the Brief notes that the NSDUH found no significant change in youth drug use during that period. The Brief also points out that the NSDUH found the main reason respondents cited for not seeking treatment was cost and insurance barriers.